The governor, who now is working with a Caribou woman whose home was foreclosed on, vows to ensure the bill gets sponsored next year if a special session, which he has the power to convene, is not called. Gov. Paul LePage’s office is working with a woman in Caribou whose home was foreclosed on, while a bill he initiated to try to protect homeowners from tax lien foreclosure remains in limbo. The bill LePage initiated to try to help elderly people stay in their homes, L.D. 1629, is one of the bills the Legislature voted to carry over for consideration if a special session is held this year. The 128th Legislature adjourned earlier this month. LePage’s bill addresses several issues, including that older people often have a difficult time understanding tax foreclosure issue and someone should be required to help them so they do not lose their homes. If the bill is not considered this year, it is dead, according to LePage, who leaves office Jan. 2, 2019. He said Friday in a phone interview that he can’t understand why legislators would hold the elderly hostage by not moving a bill that would help the elderly stay in their homes. “I’ll make sure I find somebody to sponsor it next year, before I leave,” he said. Because of term limits, legislators go in and out of office and do not get the experience they need, according to LePage. But Democrat House Speaker Sara Gideon said Monday that LePage holds the key to a special session that could lift his bill and every other bill that has not been resolved out of its legislative limbo and get lawmakers working again. Despite his push to pass the bill, LePage has also worked against efforts that would build more affordable senior housing across the state, according to Gideon. In 2015, the Legislature gave bipartisan approval to a proposal to borrow $15 million to help provide seniors with affordable, energy-efficient homes or for weatherization and “adaptive reuse” of existing structures. Nearly 70 percent of voters approved the bond package in November 2015. LePage has yet to issue those bonds, which expire in five years. Last June, the House Republicans blocked an effort to override the governor’s veto of a bill that would have allowed the state treasurer to sell the bonds for the projects without any approval from LePage. 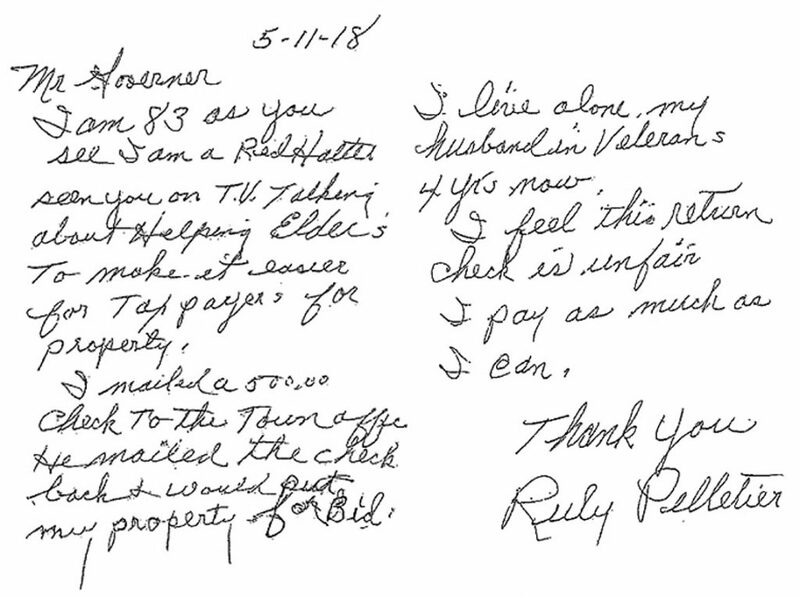 Ruby Pelletier, 83, sent LePage a card dated May 11, saying she had seen him on television talking about helping elderly people stay in their homes. She had given the city of Caribou $500 toward her tax bill, but the town mailed it back, saying it would put her property out to bid, according to her note. Pelletier wrote that she lives alone and her husband has been in a veterans’ home for four years. LePage said in a phone interview Thursday that he could not believe the city sent her check back to her. “It’s just unbelievable. I was just beside myself,” he said. Pelletier said Friday in a phone interview that around May 1 she took a $500 check to the Caribou Municipal Building, but it was mailed back to her. She said she owed more than $1,000 in taxes from last year. “I offered to make payments once a month, and they refused,” she said. She said her husband, who is 85 and owned an upholstery business for 40 years in Caribou, is gravely ill, and she has told family members to visit him as soon as possible. She worked in restaurants and schools many years and baby-sat after retiring, but she has had difficulty keeping up with bills since her husband went into the veterans’ home, she said. Caribou Finance Director Wanda Raymond confirmed Monday that Pelletier’s home was foreclosed on. “We’re just following our tax-acquired policy, so it had gone to foreclosure and we cannot accept payment after that,” said Raymond, who also is the city’s treasurer and tax collector. Raymond declined to say how much money Pelletier owes, asking a reporter to call back in a few weeks. “I’d rather not do a story on this right now because we are going to be speaking with her and I just don’t think she understands the process,” she said. LePage initiated L.D. 1629, which was sponsored by Rep. Ellie Espling, R-New Gloucester, after the town of Albion foreclosed on an elderly couple’s home on Lovejoy Pond in December 2015 and sold it in a sealed auction for $6,500 after a neighbor who came to the couple’s aid offered $6,000. LePage said the property was worth $70,000 to $80,000, and that equity they had built in their home was lost. 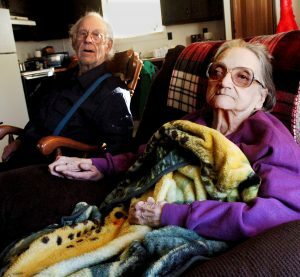 The new owner evicted the couple, Richard and Leonette Sukeforth, who are in their 80s and now live in a nursing home. After weeks of debate and revisions to the bill this year, LePage said last month it still had some problems, but he thought it was headed in the right direction. Richard and Leonette Sukeforth lived in Holden with their daughter after they were evicted from their home in Albion in January 2017. The town foreclosed on the property in 2015 for non payment of taxes and sold the property. The couple now reside in a nursing home. The initial bill, An Act to Protect the Elderly from Tax Lien Foreclosure, was stripped during several work sessions by the Joint Standing Committee on Taxation, but a proposed amendment drafted in a compromise effort with input from Legal Services for the Elderly, Maine Municipal Association and Pine Tree Legal Assistance Inc., was passed unanimously by the taxation committee. The title of the bill changed to “An Act to Protect Homeowners from Tax Lien Foreclosure” as part of the amendment. The bill requires that within 30 days after recording a tax lien certificate with the registry of deeds on a property owner who is receiving a homestead exemption, municipal officials must provide the owner written notice that he or she is eligible for a tax abatement and, upon request, must help them to request an abatement. The municipality also must provide information about the procedure for making such a request, according to the bill. It must let the property owner know that he or she may seek help from the state Department of Professional and Financial Regulation’s Bureau of Consumer Credit Protection about options for finding an adviser who can help them work with the municipality to avoid tax lien foreclosure. And the municipality must provide contact information for the bureau. After a foreclosure, according to the bill, a municipality must list a property with a licensed real estate broker who is not employed by the state or municipality, and the property must be sold at fair market value or the price at which the broker reasonably anticipates the property would sell for within six months after listing. The listing and sale are contingent on several conditions. The property owner must be receiving a property tax exemption as a homestead; must be 65 or older and must have an income of less than $40,000 for the year before the year the property went into foreclosure, or if the property owner is filing jointly with another person or persons, their combined income must be less than $40,000; and the property owner must have liquid assets of less than $50,000 or, if two or more people are filing a claim jointly, the combined liquid assets must be less than $75,000. The bill also says that if a municipality is unable to contract with a broker for the sale of the property or if the broker cannot sell it within six months, it may be sold through the process used by a municipality to dispose of all other tax-delinquent property. Seventy-five percent of the net proceeds received from the sale must be paid to the former owner, with “net proceeds” defined as the sale price minus taxes owed, interest, fees including broker’s fees and other expenses incurred by the municipality or state tax assessor. In a public hearing and through three work sessions held over several weeks, taxation committee members debated the language in the bill, with some saying it would place an unfair burden on municipalities that already help elderly people with tax abatements if they request them, and some saying they did not think the state should interfere in the way municipalities sell properties. Both sides — LePage and the Maine Municipal Association — still had concerns about parts of the bill. LePage said he was concerned about the $40,000-or-less income figure for a property owner because he or she might have major medical bills exceeding that income. LePage wanted to ensure that a means test includes an assessment of medical bills and ability to pay taxes. The governor said he also was concerned about the part of the bill that says a municipality could sell property through the process it uses to dispose of all other tax-delinquent property if it can’t contract with a broker or the broker can’t sell it within six months. He said it must be an open, rather than a sealed, bid process to ensure transparency. A municipality should accept reasonable offers, and there should be no incentive to hold on to the property to auction it later by sealed bid, according to LePage. Listing it with a broker, he said, would ensure it is on all real estate search engines and would have high visibility. Meanwhile, Maine Municipal Association Executive Director Stephen Gove said in an email recently that he believes the association’s legislative bulletin answers questions about the association’s position on the amended bill. But the amended bill has a “silver lining,” according to the association bulletin: The committee was willing to fund most of new municipal costs required by the bill. Staff writer Emily Higginbotham contributed to this report.